To further streamline your workflow, we found a cool shortcut that will give you a desktop icon to open up your management software in just one click. Rentec Direct’s online software will still be accessed through your internet browser, yet have the look and convenience of a native desktop app. You can easily install an icon to your computer desktop, that will instantly open your Rentec account – this eliminates the need to open an internet browser, go to the login screen and then login – you just saved a few steps! The following instructions walk you through setting up a desktop shortcut for accessing Rentec. 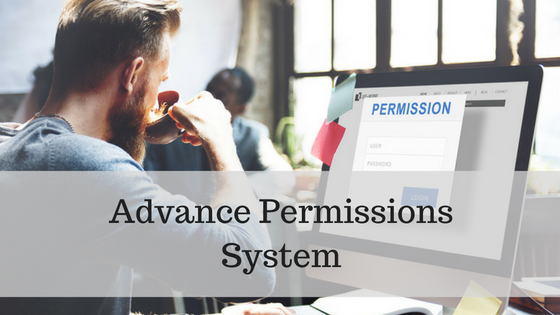 You will get all the benefits of using the cloud-based software, coupled with the easy accessibility of an application that feels like a native desktop app. Step 1 : Download and install Chrome. These instructions are for using Rentec Direct with the Chrome web browser. Step 2 : Login to your Rentec Direct account in a new Chrome window. Open up a new Chrome web browser and login into your Rentec Direct account. 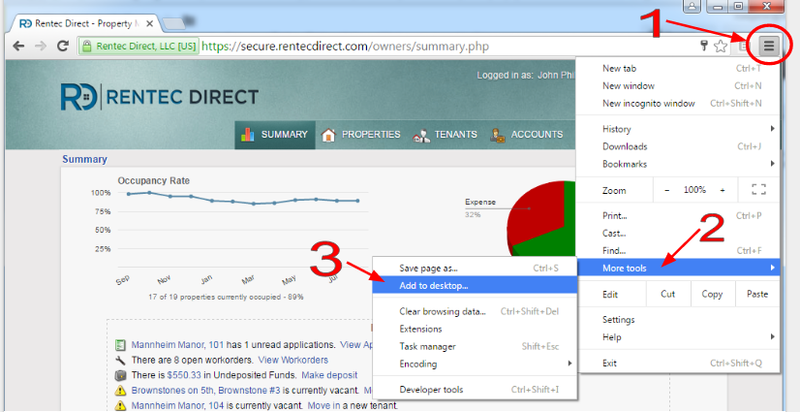 Step 3: From the Summary Page of your Rentec account find the “hamburger” icon to the right of the address bar. It looks like 3 small lines stacked on top of each other. the complete the following 3 steps that correlate to the image below. Step 5: Voila! Set up is complete. You should see an “RD” logo icon on your desktop. When you click on the icon, your Rentec Direct account will immediately open. If you want to delete the desktop app, simply right click on the icon at anytime and select delete. Is this the same as a native desktop app? 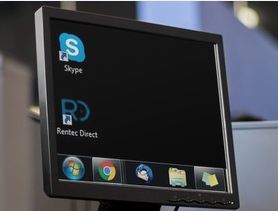 Your new Rentec desktop icon is simply a shortcut to your online software account. Rentec Direct does not have a native desktop app. Cloud-based software, like Rentec Direct, gives you the benefit of accessing your program from any device with an internet connection. Native desktop applications can only be access from the computer they are downloaded on. If your computer were to crash or get stolen, you would lose all the information stored on your native desktop app. Additionally, cloud-based services will release new features that are immediately available to the user, without needing to manually run a “software update”. This new desktop icon shortcut gives you a way to easily access your online management system and along with the convenience of a native desktop application. NextCan’t Open Downloaded Reports in Excel?